Last year’s FrightFest had, as its opening night triptych, suspense thriller The Guest, followed by violent exploitation film Sin City: A Dame to Kill For, followed by tongue-in-cheek creature feature Zombeavers. It wouldn’t be exactly accurate to say that this year’s opening night was modelled on last year’s, because Cherry Tree does not resemble The Guest, so it must be just a coincidence that Turbo Kid, a violent exploitation film, plays second, with Stung, a tongue-in-cheek creature feature, closing the night. It’s quite a remarkable coincidence, really, given how close the giant-hornet premise of Stung seems to that of potential Zombeavers sequel Zombees; but on the other hand FrightFest is always full of these silly things. I call them fake “B”-movies. You know their type: Snakes on a Plane was probably the most visible example, almost ten years ago now, and like most of its genre-mates it was sold mainly on the flawed premise that, with a title that dumb and a premise that outré, it was clearly a future cult classic no matter what. The problem was that once you got over the snakes being on the plane, the film really wasn’t that remarkable, and since you probably heard about it over the Internet long before it came out, that left a lot more than ninety minutes for the novelty of the concept to wear off. The poster was better than the movie, and that’s often the way with these movies. Turbo Kid is Mad Max on a bicycle (Mad BMX, surely?) with added ultraviolence, superheroics, and unnecessary romance subplot. It’s OK – if you like the sound of it so far, then you probably will enjoy it – it’s just bad luck for the film to come out in the same year as Mad Max: Fury Road. 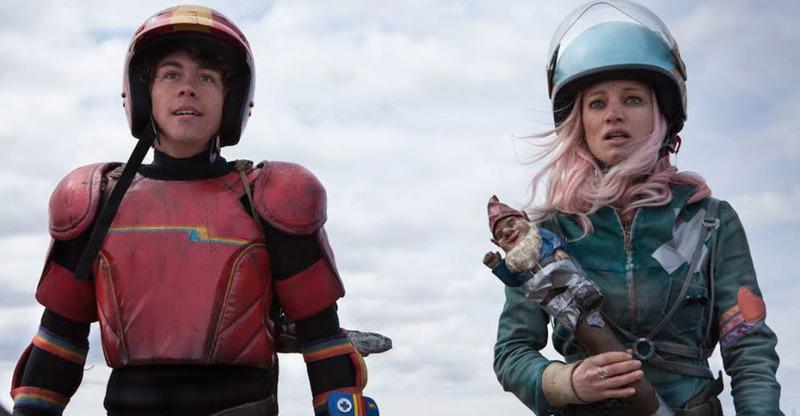 That film does a much better job of being a campy throwback to the original Ausploitation classics, while also being a fantastic film in its own right, which Turbo Kid is a little iffier on. Still, it has one up on Fury Road in the violence department, and I suppose it’s perfect for anyone for whom that film was insufficiently nostalgic. Turbo Kid is functional, though, in the sense that its jokes are funny and its action sequences are exciting, whereas Stung often struggles even there. I wasn’t huge on Zombeavers but it had some highly memorable comedy bits that I still smile at the memory of. Stung’s comedy is awkwardly broad, and its actors are adept at neither the comedic nor the dramatic mode. You come to expect comedy with these out-of-control creature films, because they’re apparently too silly nowadays to scare audiences like they used to, but funnily enough Stung was a tedious comedy and a fairly decent monster film, with a nice and revolting sequence towards the end set in the very hive of the hornets. It reminded me of the only scary bit in Alien: Resurrection, when Ripley finds herself in the Queen’s lair, and I mean that as a compliment. That bit’s well good. So I spent the first act of Stung rolling my eyes at the irritating “B” irony, before surprising myself by enjoying the second and third acts. It’s just a shame that the film goes on to add a fourth, fifth and sixth act, giving me unpleasant flashbacks to needing a wee throughout the twenty minutes of endings when I first saw Return of the King at the cinema. My favourite fake “B” of the weekend was DEATHGASM (“because lowercase is for pussies”), a New Zealand comedy in which a metal band accidentally bring forth the legions of Hell. I had certain problems with it narratively – the peril begins too early, and fails to escalate satisfactorily; the characters were either bland or obnoxious, and so couldn’t generate much sympathy; the female character was so blatantly a love interest and nothing more she might as well have been Miss Interest, first name Love – but it’s genuinely funny, which goes a long way towards making its flaws forgivable. And it works for its laughs, too; rather than dash off a premise and get lazy thereafter, it uses actual jokes, ones that come from characters and arise from its scenario and it neither laughs at itself nor asks you to. You’re laughing with it, and if you’re a confirmed metalhead (I’m afraid I’m not), then you’re laughing with it all the louder. Having seen all of these fake “B”s, I did go along to one genuine “B”, the 1980 lost “classic” Hawk the Slayer. It’s very cheaply made and suffers a lot from the usual pomposity and reactionaryism of high fantasy, but it’s endearingly kitsch and has a few creative touches, so offers some enjoyment on more than an ironic level. One awaits the upcoming sequel, Hawk the Hunter, with curiosity. Remake, Remix, Rip-Off is a documentary on the Turkish exploitation cinema which reigned from the 1950s through the 1990s. For film aficionados, it’s a little sickening: films were churned out two-a-week like the Chinese bootleg toys you find in pound shops, brazenly stealing from Hollywood and even more brazenly from each other; recycling scripts and locations and music; performing stunts with no regard for the actors’ (yes, actors’, not stuntmen’s) wellbeing; never giving a thought to cinematography or continuity and especially not to copyright. The account of an industry so uncreative it almost becomes a form of creativity is interesting at first, but the film loses its narrative for a very long time in the middle, between the rise of New Hollywood and the dawn of proper Turkish cinema, showing clip after clip of the awful Turkish versions of Exorcist, Star Wars and Jaws. Some of these clips are funny, but once you’re used to unconvincing effects, non-existent sets and children’s-Halloween level costuming, the power of these things to shock or amuse wears off, and the effect is similar to waiting patiently for an acquaintance to finish a long joke only he finds amusing, so conversation can resume. When conversation does resume, we get five minutes of really good material on government censorship and the social power of cinema – then the film ends just as you were getting interested again.